The role patient experience is playing in the provider environment today cannot be understated. The Beryl Institute State of Patient Experience 2017 Study showcases the growth our industry has seen over time. 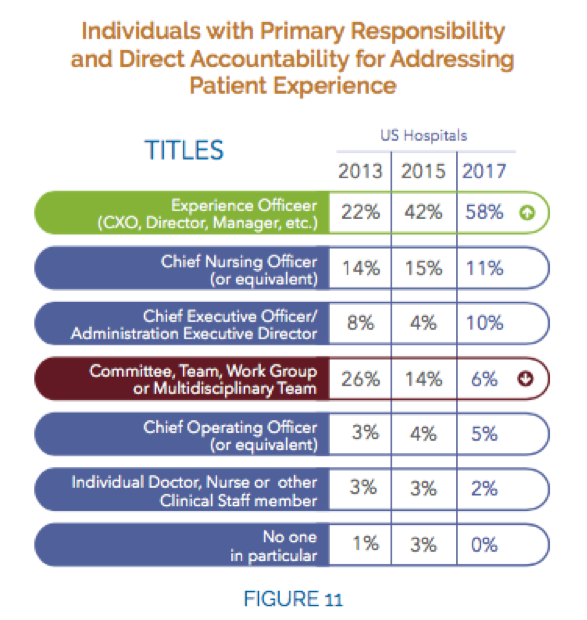 Organizations with individuals (CXO, Directors, Managers) with primary responsibility and direct accountability for addressing patient experience has gone from 22% of US hospitals to 58% in 2017 (n=944 US Hospitals). 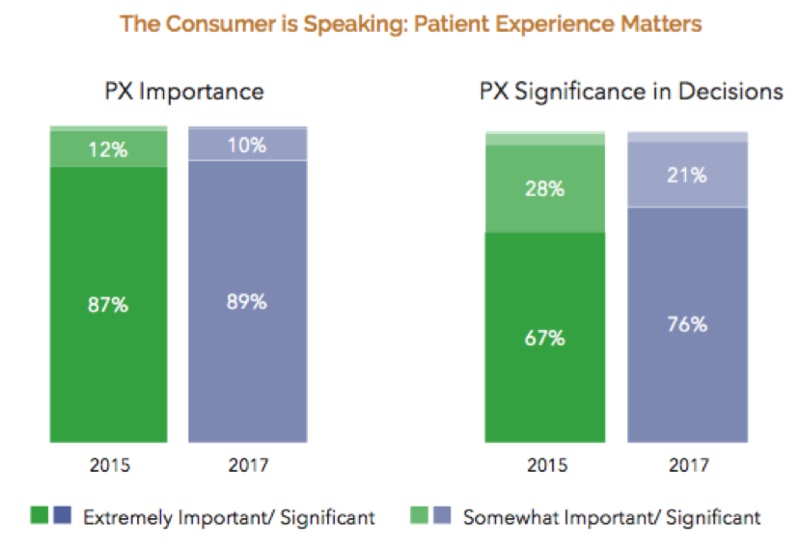 On the other hand, consumers who say patient experience is significant to them in their healthcare decision making went from 67% in 2015 to 76% in 2017. The importance of patient experience has been so far-reaching that boardrooms across the industry are taking account. In fact, according to the Advisory Board’s Annual Health Care CEO Survey in 2018, “meeting rising consumer demands for service” was in the top 5 priorities along with cost control, and exploring diversified, innovative revenue streams. The good news is that there is overwhelming research that shows that improving patient experience not only leads to better quality outcomes, it, in fact, also leads to greater profitability for healthcare providers. With increasing demands on their time, patient experience leaders and executives have to turn to technology to facilitate the impact patient experience can have on the bottom line of a provider organization and the resulting patient outcomes. In fact, technology is so closely tied to the major initiative of “meeting rising consumer demands for service”, consumer technology and the ability to get access in the palm of your hand has driven the focus on providing more information and an exceptional care experience to patients alike. And the importance of technology in the provider arena around patient experience is being noted by leading CIOs across the country as well. A new study by Impact Advisors and Scottsdale Institute shows that more than 80% of CIOs reported that their high priority is finding ways to improve digital health engagement and optimizing the patient experience. The high level of interest “underscores a growing recognition – especially among industry leaders – about the critical need to be able to compete on convenience, access to care and value – as defined by patients”, states the report. Hospitals and clinics have to offer technologies that make care more accessible, convenient and the experience more seamless. Which leads me to the question: If CEOs are focused on consumer demands for service, the CIO is focused on technology related to patient experience; then what should the patient experience leaders do? And the answer is clear - they need to take charge now and guide the technologies that are being looked at by their organizations that are focused not only on patient experience but also engagement. On the other hand, patient experience leaders also need to get intimately involved and have their voices heard by technology innovators and pioneers developing solutions for the industry. The technology industry needs to hear from those who spend their daily lives creating a better environment and experience for patients and providers alike. The time is now to collaborate, share and move the patient experience industry forward and bring a realistic consumer revolution to the table that is validated by the key stakeholders. One of the best ways to do so is to get involved in The Beryl Institute's PX Solutions Feedback Program. Solutions providers gain access to the subject matter expertise of patient experience leaders and decision makers to obtain feedback to evaluate and assist in developing or enhancing programs and services. The candid feedback provides the potential for widespread and global application for healthcare and the opportunity to reinforce the commitment to support the patient experience movement. Experience leaders are in a unique vantage point to share their insights – and the time has come to take lead and help usher in a new era of breakthrough tech innovation! Samir Batra has been in healthcare for 17 years and has worked with many global healthcare provider organizations in helping them achieve operational efficiency and implementation of their strategic plans. Majority of his work has focused on the patient experience, workflow and cost optimization and the effective use of technology. Currently, Mr. Batra is the Founder & CEO of BAHA Enterprises. BAHA is focused on helping health tech companies grow by raising capital, providing strategic advice and guidance, and validation of their solutions. Prior to BAHA, he spent over 10 years in executive roles at start-ups (Oneview Healthcare, CareInSync, pCare - TVRC, and GetWellNetwork) focused on applying technology to effect clinical and patient processes to improve the patient experience and drive engagement. 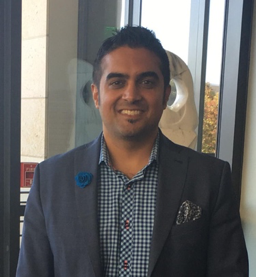 Passionate about contributing to thought-leadership, he is active with HIMSS (NorCal Board Member), ATA (Start-Up Health Advisor - American TeleMedicine Association), and The Beryl Institute (Resource Advisory Council).